The most critical test of this system will take place in February 2017, when Iran is scheduled to perform a "full launch" of the system, according to research performed by the Foundation for Defense of Democracies. "The Simorgh launch [has] been anticipated since February 2016," according to an FDD policy brief. "The head of Iran’s space agency told the media in March that the launch would have three phases: one test launch in spring, another between August and September, and then a full launch in February 2017, probably to coincide with the anniversary of the 1979 Revolution." The timing of the test is likely to put the newly inaugurated U.S. president in a difficult diplomatic position, particularly in light of vows by Republican candidates to ditch last summer’s nuclear deal with Iran. "The full planned launch of the Simorgh space-launch vehicle in February 2017, which coincides with the 1979 revolution, would likely be the next U.S. administration’s first major test with regard to the Islamic Republic," said Amir Toumaj, an Iran expert at FDD. "Iranian President Hassan Rouhani will face his own elections in June 2017," Toumaj said. "There may be a temptation to focus U.S. policy on strengthening the hands of Rouhani as if he or elections over time can overcome the state run by the more hardline elements of the regime. The next U.S. president should have a comprehensive Iran policy ready at hand." 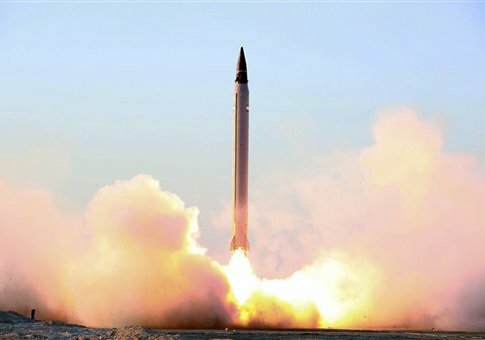 Iran’s research into space technology has long been seen as a cover for its work in intercontinental ballistic missiles. "Tehran’s civilian space program has long been suspected to be a cover for its inter-continental-ballistic-missile (ICBM) program—missiles with ranges in excess of 5,500 kilometers that can threaten Europe or even the United States if Iran achieves 10,000-kilometer ICBM capability," according to FDD. "Space launch vehicle (SLV) technology of civilian programs is practically identical with ICBM technology," according to the brief. "Tehran has masked the military origins of the program and then provides additional cover by making announcements that it will not develop ballistic missiles with ranges of over 2,000 kilometers." U.S. officials have estimated that Iran could fully deploy this technology by 2020. Parts of this technology have been given to Iran by North Korea, which employs similar types of missiles. "Iran’s cooperation with North Korea on rockets raises more red flags. The Simorgh, which has enough lift to carry a nuclear warhead, is based off of North Korea’s Unha rocket," according to FDD. "The cooperation between Tehran and Pyongyang on ballistic missiles is well-documented, and North Korea has also assisted Iran on its SLV program." The U.S. intelligence community has reported that North Korea delivered at least two shipments of key missile components to Iran since September 2015. "North Korea also likely procured Iranian assistance in the successful testing of a solid-fuel engine rocket in March 2016, a step towards developing ICBMs," according to FDD.